The address bar in Safari shows you what website URL you are currently visiting, and it also doubles as a search bar in recent versions too. That makes it a fairly critical component of the Safari browser for many of us, so if you use Safari as your default web browser and find that it mysteriously has gone missing, it’s understandable if you’d be a bit annoyed. It’s likely that if the address bar has disappeared that a setting was accidentally toggled or disabled, and thus it’s almost certainly easy to recover and reveal again if you find yourself in this situation. 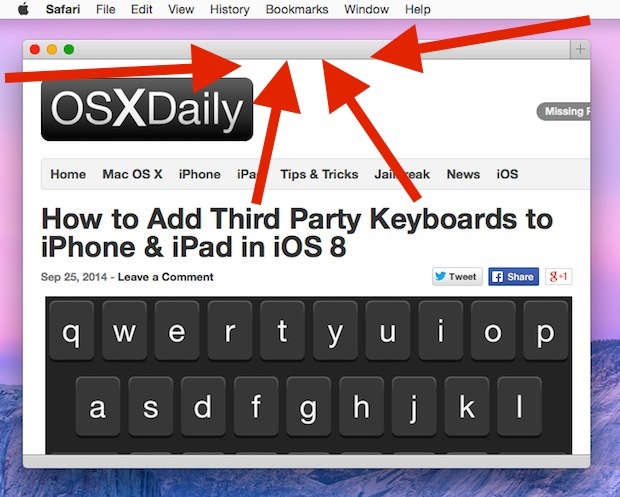 The first thing you’ll want to do is make sure the Safari toolbar is set to be visible, because where URL’s and web addresses are displayed is part of the toolbar. Just pull down the “View” menu and select the first option, which if it’s hidden should be “Show Toolbar”. 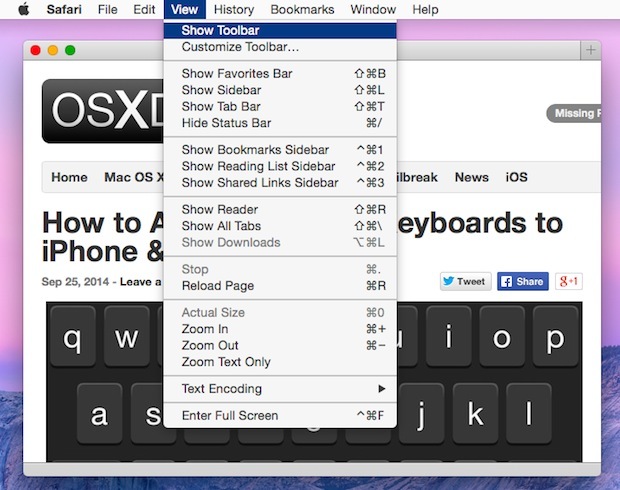 That should make the entire toolbar, with back & forward buttons, URL bar, sharing features, immediately reappear. If the toolbar is visible but the address bar is still missing, it means the toolbar was probably customized and the URL bar removed. That’s also an easy fix. Again, return to the “View” menu and choose “Customize Toolbar”, then drag and drop the default option into the toolbar to regain the lost address bar / smart search field and all other toolbar components. This applies to the desktop versions of Safari in OS X, and the behavior of Safari on the Mac is different from Safari in iOS, which auto-hides the URL and navigation bar to conserve screen space. The Mac version does not do that, so if yours goes missing, it’s almost certainly the toggled setting situation described above. One thing that Safari for Mac does do though is shorten the URL in the toolbar, which must be changed if you want to see the full URL of a website via a settings option. 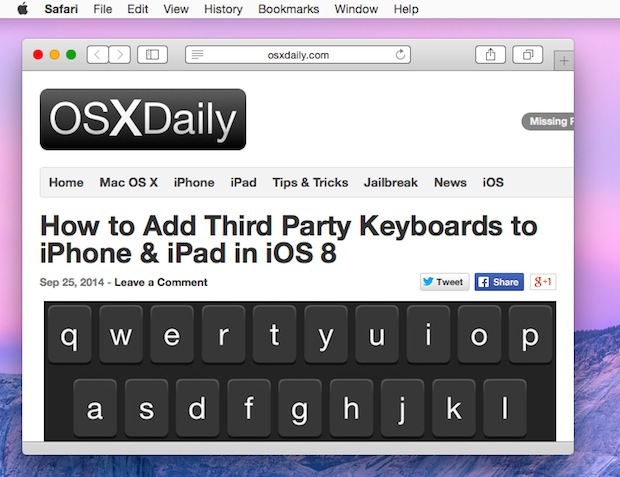 The tabs are so dark in iOS 8 that we can’t see the X to close the tab. It is really bad. Are there any adjustments to make it visible? No they aren’t. The header is always white, or light gray, and you see the X to close that page (they don’t call them tabs in iOS). I don’t know why the developers would think it’s a good idea to hide the address bar. Users should always be able to hide/turn features off but it’s nice to know where you are. I think most users can quickly eyeball a URL and know that’re on oxdaily or ESPN or whatever. I’m new to Mac OS X and thought i might have malware! Thanks, that was the most simple answer and the quickest solution to my dilemma, P.
Thanks. Your article was simple to follow. Complete success. Thanks so much! I am fairly knew to Apple and could not understand why my URL address bar and back arrow had disappearred. All I needed was to show toolbar. Thank you! – and the world is back “in order”. this is so stupid. why would apple even make it disappear? what? we are never going to want to go any other place than what we have in our favorites? lame “feature”. You saved my day- Thank you so much for posting this! Any help would be grateful?? Thank you!! Fixed it within seconds literally! Thanks! Quick and easy fix. A huge thank you for this advice…worked like a charm!! Other pages did not address this properly or step by step, thanks again! !